Rick And Morty will somehow be live streaming Bethesda’s latest installment of their post-apocalyptic universe, Fallout 76. Though the game’s release date isn’t until Nov. 14, the beta version of the multiplayer online game has been in its testing period for a few weeks now. While fans wait in anticipation for the official release, Bethesda hasn’t been letting anyone down with their mess of varied, and interesting, promotion. For example, Fallout‘s mascot playing a game of Horse with Philadelphia 76ers forward Markelle Fultz (while wearing Fallout basketball jerseys of course). 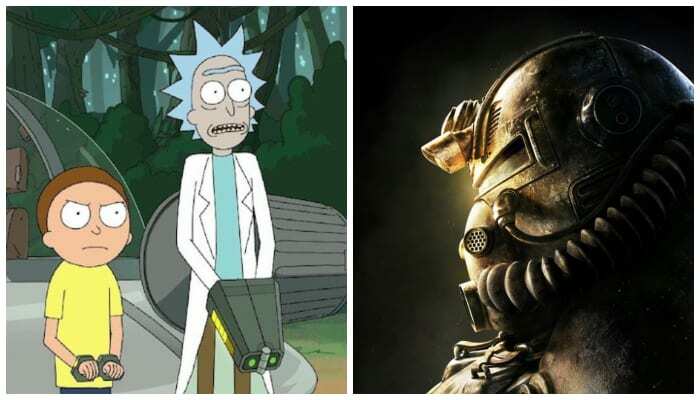 Fallout’s next promotion will definitely be an unusual one as Rick and Morty from the Adult Swim cartoon will be live-streaming Fallout 76 (in some way shape or form). If that weren’t enough, the characters will be joined by pro gamer Ninja and rapper Logic for the event. Wubba lubba dub dub! Watch @adultswim‘s @rickandmorty play #Fallout76 on @Xbox One with @Ninja and @Logic301! Tune in on @Twitch and @WatchMixer. Will you be watching Fallout 76‘s Rick and Morty livestream? Let us know in the comments!